KTO theater's "The Fragrance of Time"
"The Fragrance of Time," a Polish theatrical impression referring to the childhood of its creator Jerzy Zoń, the director. The show is an open-air theatre and it tells a story about childhood with fear, cruelty of war and love without any words. An hour of this nostalgic performance will take the audience back into the past with the feeling of leafing through an old family photo - album. This feeling of the nostalgic past is stressed by the overwhelming classical hits as "The Nutcracker," "Symphony No.5 in E minor" and "Capricio Italien" by Tchaikovsky. KTO production of "The Fragrance of Time"
KTO Theatre was founded by a group of graduates from Jagiellonian University in Krakow. 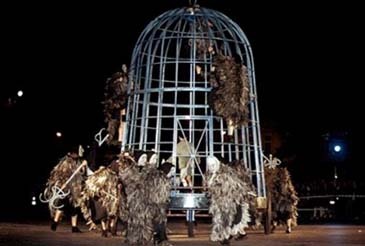 Since 1985 the theatre has produced several street performances. Traditional stage experience together with street theatre experiments constituted a specific language of the theatre, where the meaning is expressed by actor's body, voice, movement, but also music and occasionally a few words. KTO Theatre derives its work style and repertoire from the tradition of medieval wandering troupes. Due to all these factors the theatre's performances win a spontaneous and warm applause from all kinds of audiences. Theatrical archetypes and emotional character of the performances break all possible barriers between the group and spectators, both in little towns and large festival halls. Friday, Sept. 22 (Friday)-Sept. 24(Sunday) at 7:30 p.m. Box Office: Tickets are available in person at the Box Office from 1:00 p.m. to 5:00 p.m., 2nd floor, Gwacheon Citizens' Hall, by telephone at Ticketpark 1544-1588, and online at http://ticket.interpark.com . The 10th Gwacheon Hanmadang Festival kicks off its "Festival of Dreams, Dreams of Festival"-themed season on Tuesday, Sept. 19, 2006, with the opening performance of Dokkebi Nolum "Eunusong." At this year's Festival, 34 performances in total will be presented, including 10 works from 6 countries such as Poland, the Netherlands, France, etc. Playing a leading role in the field of Street Theatre in Asia, Gwacheon Hanmadang Festival programmed its 10th year with 100% of Open-air theatre. Besides the adventure of dynamic theatre, there will be a variety of events such as "Festival of Foreign Culture-France," "Street Theatre Competition," "Photo Exhibition," etc. Besides the adventure of dynamic theatre, there will be a variety of events such as "Festival of Foreign Culture-France," "Street Theatre Competition," "Photo Exhibition," etc.